Brand new in we have fabrics from the Curiosities patchwork fabric range from Benartex. Nancy Halvorsen's latest collection for Benartex is full of cool surprises, from the big beautiful flower print, to the alphabet circles with fun illustrations. 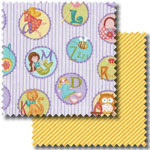 In addition to a wonderfully whimsical height chart panel and Curiosities flowers, this fabric group features neat textures, including giant polka dots and Nancy's signature swirls in bright yellows, aquas and violets.